To help combat a marked increase in gun-related crime in our community, Champaign County Crime Stoppers launched a 3-month pilot initiative called the Gun Bounty Reward. 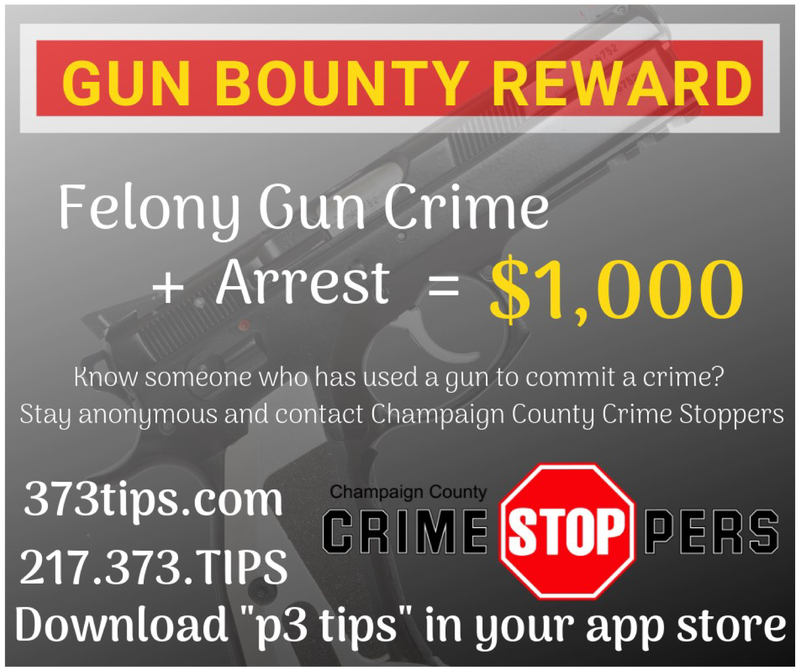 Anyone who contacts Crime Stoppers with a tip that leads to the arrest of a person who used a gun during the commission of a felony crime in Champaign County will receive our maximum $1,000 cash reward. As always, to be award-eligible tips MUST be submitted directly to Crime Stoppers via our phone line, this website, or our free P3 Tips mobile app. This initiative will run thru April 30, 2019, but may possibly be extended if public donations are made to continue to fund this expanded reward. Want to help support us solve gun-related crimes? Make a donation now! Crime Stoppers is NOW ACCEPTING nominations for the Dave Benton Crime Fighter Award. Nominations due by June 1. As part of our support of local law enforcement, Champaign County Crime Stoppers will award one $500 scholarship to a graduating high school senior from Champaign County who is planning a career in the field of Criminal Justice. Deadline to apply is May 20, 2019. Want to support Crime Stoppers and help us solve crime here in Champaign County? Please make a donation using the DONATE link on this page. Thanks for your support! Follow us on Facebook or Twitter for the latest information about wanted subjects and fugitives. For your safety, do NOT provide tips or information to Crime Stoppers via social media. Only provide that information via this webpage, our P3Tips mobile app, or our TIPS phone line (217-373-TIPS). Anonymous crime reporting at your fingertips! Download the free P3 Tips app for iOS or Android and quickly and discretely submit tips from your smartphone. The app is free and the technology scrubs all personally identifying information to guarantee your anonymity. YOU can help the police solve crime and get criminals off the streets. REMAIN ANONYMOUS. RECEIVE CA$H REWARDS. Champaign County Crime Stoppers encourages the public to assist local law enforcement in the fight against crime by overcoming the two key elements that inhibit community involvement: fear and apathy. 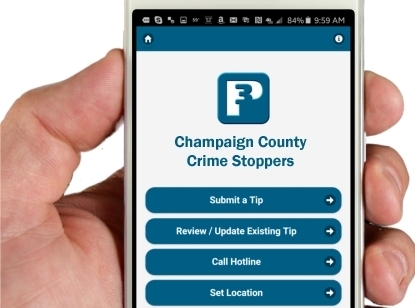 Champaign County Crime Stoppers provides three main ways for tipsters to anonymously give helpful information to local law enforcement. If your tip leads to an arrest, you could receive up to a $1,000 cash reward. Call our call center at 217-373-TIPS. This professional call center is operated by civilians (not law enforcement) and are specially trained to take crime stoppers tips. Information will be anonymously relayed to local law enforcement for investigation. Submit a web tip on this webpage (click Give a Tip icon at top left of this page. Complete the form and send it in. All tips are reviewed by trained professionals at our call center then relayed to local law enforcement for investigation. NOTE-Tips received via email, social media, reported directly to 9-1-1, police, etc., will NOT be accepted, processed, or eligible for a reward from Crime Stoppers. When you contact Crime Stoppers, you are not contacting law enforcement. We do not record phone calls or using any tracking schemes. Sophisticated technology is employed to ensure your identity will never be known to anyone. With the public's help, local law enforcement can get the criminals off the streets and make our community a safer place to live. You will remain completely ANONYMOUS and neither Crime Stoppers nor the police will ever know your identity. We don't want your name, just any information to help solve local crimes and put criminals behind bars. Champaign County Crime Stoppers relies on a community volunteer board of directors and tax deductible contributions from the public in order to operate the program.